Unsurprisingly, this week I've written an Easter recipe. I often find it difficult to make original, interesting holiday recipes as it seems they've all already been veganised. Fortunately, a quick internet search for Easter biscuits doesn't pull up too many hits. Perhaps they're not a tradition in the US of A? Although 'biscuit' means a different thing over there, right? Lost in translation? Anyway, they're certainly traditional in England. 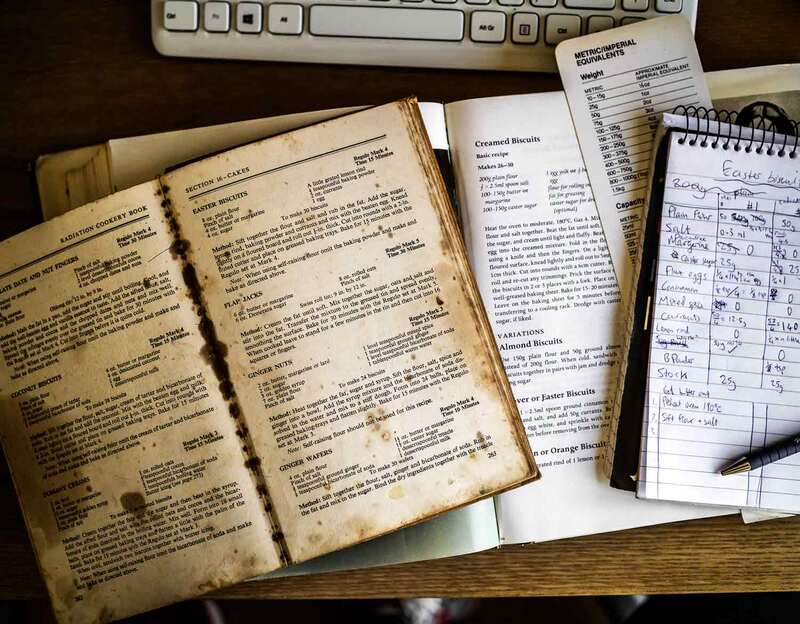 So traditional, in fact, that I found recipes for them in old, old cookbooks like Mrs Beeton's 1600-page 19th century tome, and also the cookbook that came with my grandmother's first oven. Here's a picture of my research. I prefer to read up like this to make sure I'm delivering original content for you guys rather than just adapting an existing vegan recipe! So, back to it. There are several ingredients consistent across Easter biscuit recipes: flour, butter, eggs, currants, wicked amounts of sugar – but the spices seem to vary. Some opt for cinnamon, some for mixed spice, and, rather surprisingly, some use lemon zest. As I suspected, in recipe tests, the lemon zest felt out of place. The cinnamon was good; nice and warming, but rather dominant. I settled on mixed spice which is more subtle and doesn't take centre stage, which is reserved for the currants, sugar, and buttery, crumbly texture. When I say buttery, I am, of course, talking about vegan butter. You can buy it relatively easily now – it's sometimes referred to as 'baking block' in large supermarkets. I use a brand called Stork, which, incidentally, became popular post-world war two, much like the books I used to research this recipe. In the US, I've heard Earth Balance make a good vegan butter for baking. Don't be tempted just to use dairy-free margarine spread, which produced doughy biscuits with too much chew. Unfortunately, simply omitting the egg didn't work as the mixture wouldn't come together. However, I found a flax egg – ground flax seeds mixed with water to form a gel – worked a charm. To make this step less laborious I use pre-ground flax seeds, which can be found at health food shops. Alternatively, you can mill your own in a coffee or spice grinder. So, what are your Easter traditions? Meat-eating readers, have you thought about trying a meat-free Easter? Don't hesitate to send me a message if you're stuck for inspiration. Preheat the oven to 175C/350F. In a small bowl thoroughly mix the ground flax seeds with 4 tsp water and set aside. In a medium mixing bowl, stir together the sifted flour, salt, mixed spice, baking powder and currants. Using an electric hand whisk, in a large mixing bowl, cream the vegan butter and sugar together until light and fluffly. Stir the gelled flax mixture into the butter and sugar. Fold in the flour and other dry ingredients, at first with a knife, then mix well with your fingers. It will eventually come together to form a ball of dough. Lightly knead the dough on a lightly floured work surface. Roll the dough out with a rolling pin to 5-10mm (approx ¼ inch). Cut out rounds of the dough using a circular fluted 5cm/2inch cookie cutter. Transfer them onto two greased and lined baking trays. Gather the trimmmings and re-roll them. Cut out more rounds and transfer them to the baking trays. Prick the surface of each round a couple of times with a skewer. Bake the biscuits for 15-20 minutes, swapping the trays around after 10 minutes, until golden brown. Keep an eye on them as every oven is different and they will burn quickly once cooked. To make the wash, mix the soy milk and agave syrup in a small dish. Once the biscuits are baked, remove the trays and brush the biscuits with the wash while they are still hot. Sprinkle them liberally with sugar. After about 5 minutes, transfer them to a wired rack to cool completely. N.B. the link to the pre-ground flax seeds is an affilate link. This means I receive a tiny commission (at no extra cost to you) if you purchase through this link. This helps me to keep creating new content for Discover Delicious.